I have been designing my great friend Nicky's save the date. As her mind has changed where she wanted to get married so did the design of the save the date. However, she set a place and a time, I was able to come up with a design that fit her style. As she is a seamstress and will be making her own gown out of organic cotton and other raw fabrics, we decided to play on the idea of fabrics for the save the dates and invites (which I will start very soon.) The save the date is very simple letterpress Tri folded. 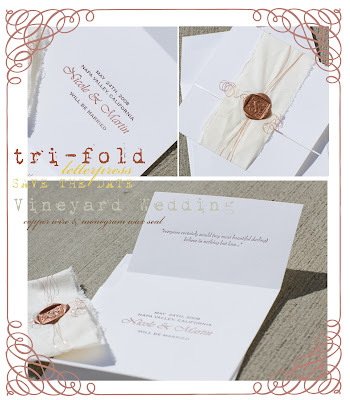 Then wrapped in torn strips of muslin, copper wire tied and curled to represent the twirly vines in a vineyard, and a monogram wax seal to hold it all in place. It really looks beautiful. As I am also helping her plan her wedding we will bring the torn muslin in everywhere we can in the decorations. It will really have a natural and very organic feel. The letterpress is a rich shimmery chocolate brown and a fun copper. It is a bit hard to open but worth it!! gorgeous use of fabric to convey texture.